This past Saturday, Sept. 22, 2018, Wilmington College hosted their annual Homecoming game against the Muskies. 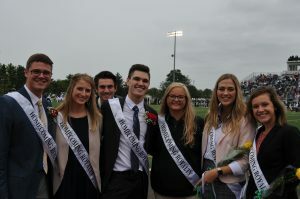 Unfortunately, the Fighting Quakers lost their game, but the audience was treated to the Crowning of Homecoming King and Queen and the runner ups, several food trucks, and activities stationed around Herman Court. For the Freshman class, the representatives were Jeffery Mansfield and Abby Ruth. For Sophomores, Cody Martin and Kadie Grundy were selected. Juniors were Jeff Clydesdale and Jen Cochran. And last but certainly not least, the Senior class had a large pool of nominees: Keni Brown, Kayla Marrero, Lawrence Daya, Andrea Barga, Brittany Ross, TJay Burbage, Shelby Dodds, and Mathew Perry. 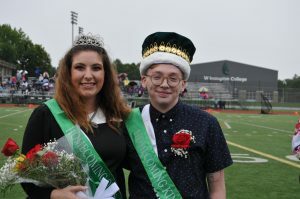 Mathew Perry and Shelby Dodds were crowned Homecoming King and Queen. When they received their crowns and sashes, both seniors had huge grins as they received thunderous applause from the stadium. Everyone was thankful to be a part of the ceremony.